phosphere is an exploratory harmonization of two distinct spaces—a dance stage and an installation component—into one performative spatial whole. Effective use of the space at Gallery AaMo necessitated a number of tricks to ensure that the installation retained its three-dimensionality even when viewed from myriad vantage points. For example, the dance component integrates a wire frame outfitted with multiple mobile cubes of varying size. The deft interaction of dancer movement along with laser projection amplifies the three-dimensionality of the entire space, imparting the viewer with a heightened sense of geometricity. Material physicality is given parity with optical and acoustical program modeling, and melds on an equal level to produce a wholly hybrid performative space. The performance is divided into nine scenes. The omnidirectional projection accesses a scanned 3D model to produce three-dimensional video onstage that interacts with the dancers’ bodies. It should be noted that although holograms have been the subject of diverse research since the advent of media art, insufficient scalability and security at the current stage have hampered their application in the realm of performance art. 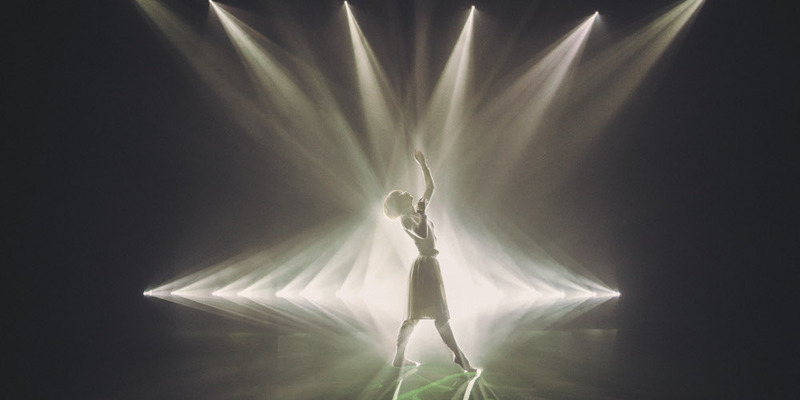 As such, the omnidirectional projection introduced in phosphere is noteworthy as a new approach to creating life-sized, three-dimensional video that moves onstage with the dancers. By processing in real-time all the elemental movements throughout the entire performance space with motion capture, it is possible to trace the movement of a dancer’s hand, for example, and instantaneously convert that movement into three-dimensional video. In turn, this technology unlocks a new realm of creative possibility, and enables a groundbreakingly minute interplay between dance and video elements. In the pivotal culmination of this spatial interplay, objects are reduced to light, and the human body is restored to the transcendently ephemeral. Planned and Produced by Spiral / Rhizomatiks co.,ltd. evala (JP) is a musician and sound artist. Presents works of leading-edge electronic music and has concerts and installations in Japan and abroad. Takayuki Fujimoto (JP) a.k.a. Kinsei is a director and lighting designer. Kinsei began participating in projects of the performance art group Dumb Type in 1987. He also founded his own company, Kinsei R&D, in 2015. ELEVENPLAY (JP) is a dance company directed by choreographer & art director, MIKIKO. ELEVENPLAY was founded by MIKIKO in 2009, and is composed of female dancers from a variety of genres. ELEVENPLAY’s methods of expression are diverse, including stages, video works, and still photos. Rhizomatiks Research (JP) is a Japanese artist group led by Daito Manabe and Motoi Ishibashi. Rhizomatiks Research mainly takes up projects focusing on the field of research and development, and sets priority in opening a new expression for the future. The jury found phosphere to be an excellent example of a complex immersive artwork / dance performance piece created by a large interdisciplinary collaborative group with visual and technical direction under media artist Daito Manabe and the Rhizomatiks Research studio. The unique performance experience brought together creatives from engineering, sound, stage design, featuring ELEVENPLAY choreography and dancers and signifies a new era of stage direction and design. phosphere (‘sphere of light’) uses advanced digital technology to reproduce the processes of crystallization of certain minerals in a physical space and participants find themselves as part of an ever-changing, intangible architecture of light flickering about them, as if guided by intuition. The movements of light beams are reminiscent of natural forms waving beneath the surface of water or blowing in a breeze. At once a scene and an installation, phosphere entails both the physical space of the room and a space imagined within a computer.